Anna, like many intellectuals, says Gorbachev's years of peristroika were the best in Russian history because they combined relative economic security with new political and cultural freedoms. (Photo by Reese Erlich) Berkut, my last name, is Russian for eagle. The sign on this shop says "Berkut," along with a bird that is not even a distant relative to the eagle—one of the many anomalies of the new Russia. These are my two sons, Vladimir (right) and Dmitri (left), four years ago on their first day of school. 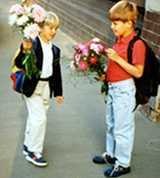 On the first day of school it's traditional for students to bring teachers flowers. That's how they looked before growing with cosmic speed into totally different people. (Photo by Anna Berkut) In 1931 Stalin's government destroyed Christ the Savior church. By 1990 the Russian Orthodox Church had laid plans to rebuild it. Today it's a familiar Moscow landmark. 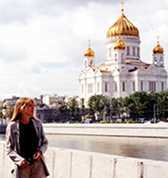 Before 1991 I was able to travel within the USSR, but not abroad. It was hard to get a visa and prohibitively expensive. By the mid-1990s, in my new job as a travel agent, I traveled abroad for the first time. Here, a pensive me rests near the famous Shaolin Temple in China.